Ryan Edwards Filming with MTV! Photo! It’s been reported that the original cast of ‘Teen Mom’ is filming for MTV again since the network wants to bring back the series. There are still no details about whether or not the show will be called something else (seeing as how they really aren’t Teens anymore) but it has been confirmed that at least some of the cast is filming right now. 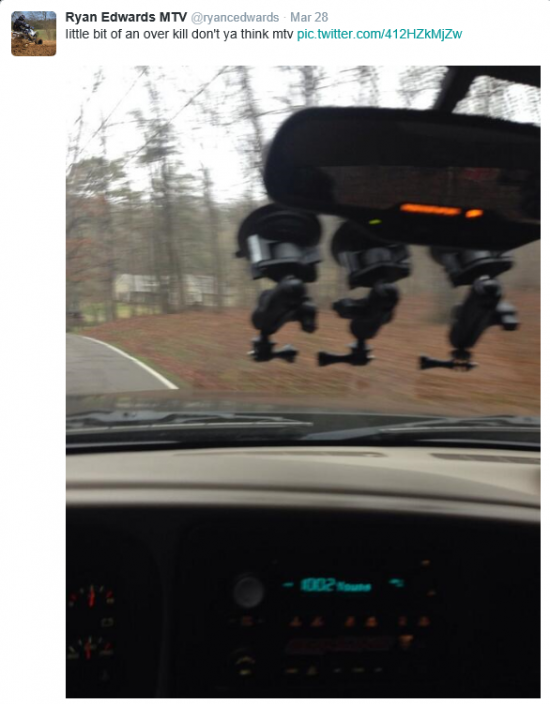 Ryan Edwards posted a photo to his twitter of MTV camera mounts in his car. I had a strong feeling the cast would be back when I watched the girls catch up specials. MTV made sure to include footage of Tyler talking to Catelynn about how much he missed filming. I took that as a hint! With some digging I found out that the cast is coming back but there are still no details about the show itself. I’m hoping that it will be more like their specials, in which they could talk about the fact that they were filming, on tv, and have money. The specials seemed more REAL to me than the Teen Mom show ever was. Do you agree? What are you most looking forward to? Previous Previous post: Maci Bookout Starts a Blog!